His House > Blog > Alcohol > Fell off the Wagon after Detox from Alcohol? Here’s Why. Fell off the Wagon after Detox from Alcohol? Here’s Why. You realized you were in trouble. Maybe you yourself didn’t see it, but a loved one or friend did and gently pushed you towards getting the help you needed. You decided to detox from alcohol at a rehabilitation facility. Although it was a long and arduous road, you found yourself feeling less controlled by alcohol. You may have even felt like your old self again. However, it didn’t last. As weeks passed since you finished your detox program, you found yourself slipping. Before you knew it, you did what you thought you never would: you drank alcohol again. You feel so many negative emotions: shame, humiliation, anger. However, on the road to recovery, relapses happen. By recognizing what triggered the relapse, you can make better choices in the future. Here are five such triggers. Stress — Everyone deals with stress differently. Some like to exercise, some like to veg out with a book or TV marathon. Others internalize their stress, letting it build and build until it comes out unhealthily. In the past, when you had a bad day at work or got in a fight with a loved one, you probably turned to alcohol. Unless you learned healthy means of combatting stress, when you feel the pressure, you’re going to want to start drinking again. Hanging with bad characters — You may have met some unsavory people while drinking heavily. You may have even drank with these people, who also may have also had issues with alcohol. Now that you’re abstaining from alcohol, you can’t associate with these people anymore. However, you’re nostalgic for those times of companionship, so if one if your old friends calls, you can’t help but go out. Spending time in bars, etc. — That probably means going right back to your old haunts, which are likely bars, liquor stores, and other similar establishments. However, research has shown that if you spend time around these places, you’ll remember how you used to drink there and then want to drink again. Being around others who are drinking — It’s especially difficult to put a recovering alcoholic in a bar when others are drinking all around them and not expect them to have a drink themselves. Eventually, with time, you’ll get to the point where you feel like you can go to a bar and abstain from having any alcohol. However, you may not be ready right after rehab, which can lead to a relapse. Thinking too much about the past — It’s easy to put on rose-colored glasses in regards to the past. You may filter out your bad memories so you focus more on the good times of your alcoholism period. Instead of thinking about debilitating headaches and crippling hangovers, you may instead remember the late nights, the laughter with your buddies, and hanging around until last call at your favorite bar. Those thoughts may make you want to drink again. It’s okay if you fell off the wagon. It happens to a lot of people on the road to recovery. What matters now is getting back on. Now that you know what may have triggered you to drink again, it’s time to try alcohol detox once more. At His Houses, we prefer a more natural alcohol detox program. 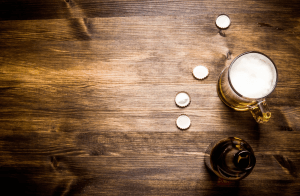 We understand that withdrawing from alcohol can be as taxing on the body as withdrawing from many drugs. We also know all the physical side effects you may go through and can prepare for these accordingly. To learn more about our alcohol detoxing programs and how to enroll, contact His Houses today.